Life, n. the unending journey toward making sense of the world. For starter, I don’t hate PhantomJS because it’s not Gecko. I love the tool and it’s pioneering idea, but the shipping version lacks of a lot of browser APIs needed for my project to run. It does not come with Function.prototype.bind (reason given here); nor I have no idea the version of WebKit it is shipping with, given the fact it comes with ArrayBuffer interface but without other basics like Uint16Array. Since JSZhuyin rely on these interfaces to work on binary data, I would have to set up the CI with anything other than PhantomJS. 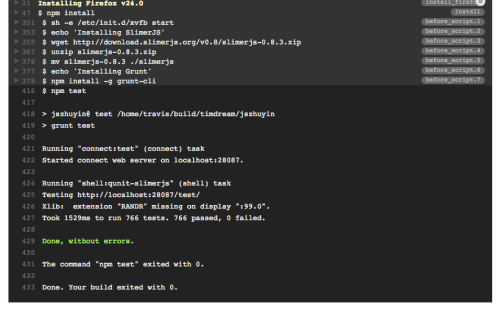 The first problem I hit was that SlimerJS does not return exit code due to Gecko constant. tee the output to a file and grep it solve the problem. The last small glitch I encountered when I push everything to Travis CI was the fact $TMPDIR directary is not actually writable in their VMs; so I moved the temporary file to the working directory instead. I hope this post will help you get everything running. Web testing and automation is a gigantic topic in which I’ve just starting scratching it’s surface; sometimes I wish there should be a simple tool where you could set it up and forget it, but I still enjoy the alternative process before that show up. This entry was posted in My Scripts, Programming and tagged Planet Firefox OS. Bookmark the permalink. Share the short link.